I know we’re in the midst of a recession. Money’s tight. Conspicuous consumption is out. But sometimes, you’ve just gotta say, f*** it, and go all out with some hard-core R&R. The next time that feeling comes a knockin’, trust me when I tell you to go a walkin’ to the Spa at the Mandarin Oriental. Here’s the back story: I recently ran into the hotel’s charming PR director at an event we were hosting for our client, Nokona Brands. I must’ve been looking particularly haggard and beaten down that night because, literally, right then and there, she insisted I come in for a treatment. I figured who am I to say no when someone tells me I need to be pampered, so the next day I booked an appointment for the following weekend. “Get there 45 min early,” she advised. I wasn’t sure why but (for once!) I’m just glad I did as I was told. Upon arrival, the receptionists couldn’t have been more welcoming. They asked me to sit, before bringing out a pair of spa slippers on a tray, taking my Nikes in exchange. Next came another tray with a hot cloth for the hands (a la Japanese restaurant style), a cup of tea and a beautiful orchid, the first of dozens I would see during the next 2.5 hours. 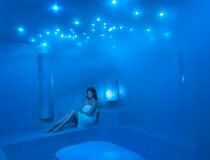 After filling out an intake form, she escorted me into the Spa and gave me a rundown of the thermal experiences. From the crystal steam room with blue ‘stars’ on the ceiling to the thermal pool to the sensory experience shower that offers four options (Body Spray, Island Storm, Tropical Rain, Arctic Mist) complete with themed water delivery, sounds and lighting, I happily bopped around from one to the next, relaxing in the beauty and serenity of the space. With 10 minutes before my appointment, I put on my plush spa robe and made my way to the waiting area….unlike anything I’ve ever seen! No couches and ratty magazines here. Instead, private areas with reclining lounge chairs offer guests continued privacy and time for relaxation. Fresh fruit, lemon water and almonds were available for nibbling as well. When Emily came to take me back to my treatment room, I realized just how large this spa really is as we traversed a labyrinth of hallways. Upon settling into the room, the first thing she did was wash my feet, before ringing a bell that signified the beginning of my treatment. I felt a little weird, all ‘servant/master’ kind of thing, but apparently a nod to the Mandarin’s oriental traditions so I just closed my eyes and went with it. In anticipation of summer, I had booked the Commonwealth Comforter, billed as “the perfect indulgence for dry, out-of-condition skin.” After climbing onto a luxurious bed, my body was scrubbed down with a combo of sea salt, frankincense and coffee. After this was completed, I adjourned to the private shower attached to the room to rinse off, before returning to the bed where I was rubbed first with a special hydrating serum followed by body butters. She was completely gracious and accommodating when I requested to ix-nay the facial piece of the treatment (My facialist would have killed me. LOVE you Brad! ), massaging my feet instead. The treatment ended with a final ringing of the bell, and I returned to the spa before once again venturing into the chaos of the real world. For my treatment, which runs $260 on weekdays and $280 on weekends, this is not an inexpensive proposition. But when you consider that it includes the use of the thermal experiences (which you’re welcome to use for as long as you’d like before and after your appointment), as well as luxurious shower facilities featuring top-of-the-line amenities, it quickly goes from being the most expensive facial or massage or body treatment in town to the most affordable. Even less expensive treatments, such as manis and pedis, get use of the same facilities. Whether it’s a day with mom or an afternoon with your bridal party or just flying solo, there is hands-down no place like this in Boston. So even though every penny counts these days, do whatever you have to do to take advantage of this splurge…because you’re worth it! Enjoy the Commonwealth Comforter at the discounted price of $200 between May 18-22, 2009. 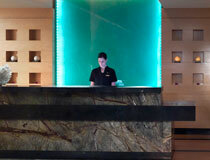 To book your appointment, contact the Spa concierge at 617-535-8820 or email mobos-spa@mohg.com.